The 49ers are revamping their run defense. First, they fired defensive line coach Jeff Zgonina on Jan. 13. Then, this past Wednesday, they chose not to pick up the option on the remaining two seasons of nose tackle Earl Mitchell’s four-year contract. Mitchell, 31, signed a four-year $16 million deal with the 49ers in 2017, and was scheduled to earn $7.3 million the next two seasons. Instead, he will be an unrestricted free agent when the new league year begins on March 13. Pierre Garcon, Garrett Celek and Alfred Morris may also be victims of the youth movement. Person, at 30, may be allowed to walk as a FA, along with Ward. Brock Coyle at 28, Mark Nzeocha and Malcolm Smith at 29, and Dekoda Watson at 30 may also be on thin ice. Richard Sherman at 30, Joe Staley at 34 and Robbie Gould at 36 should all be retained, if possible. Time caught up to and stopped the Duke of Earl. OT, but in their search for a Strength and Conditioning Coach, and Head Trainer, it appears that there will be an overseer, so both people are on the same page. Sounds like the consultation with Bob Myers of the Warriors is paying off. “Earl has been a fantastic asset to this entire organization for all the things that he’s done,” defensive coordinator Robert Saleh said Wednesday at the Senior Bowl in Mobile, Alabama, courtesy of 49ers.com. “It’s an opportunity for other guys to try and step up. It will not be easy to try and replace him, that’s for sure. This is the kind of crap that makes me wish that coaches were unavailable for questions. If they’re just going to BS you then why bother asking them anything. They have gobs of cap space and he had two years left. If he is really going to be that hard to replace you’d just keep him. I suppose Lynch, Shanahan, and Saleh could have openly called out Mitchell as a marginal player and just let it go at that….”We’re so done with his average-at-best play, next question.” I’m confident 9er players and those out there who’d consider playing for the 9ers would love that public candor as well. Coaches are coaches. Put a mic in front of them and they’re deceitful jerks. Bad on Saleh…and the dozens and dozens and dozens (hundreds?) of coaches at the pro, college, and high school levels who do the very same. Is credibility–calling out marginal or average players in a public forum–that critical? What would you have Saleh, or any coach say? It’s great being a fan, no? We get to call BS on every stinking thing–with no accountability. A model for credibility. Saleh volunteered the information and, sorry Cassie, very few people (including me) believe that this is a candid evaluation of Mitchell by Saleh. Saleh didn’t have to praise him any more than he had to call him out. He could have limited his comments to strictly the man himself and left any mention of his abilities as a football player to himself. Actions speak louder than words. They cut him. There is the other constraint of roster size — no point in having two two-down players. 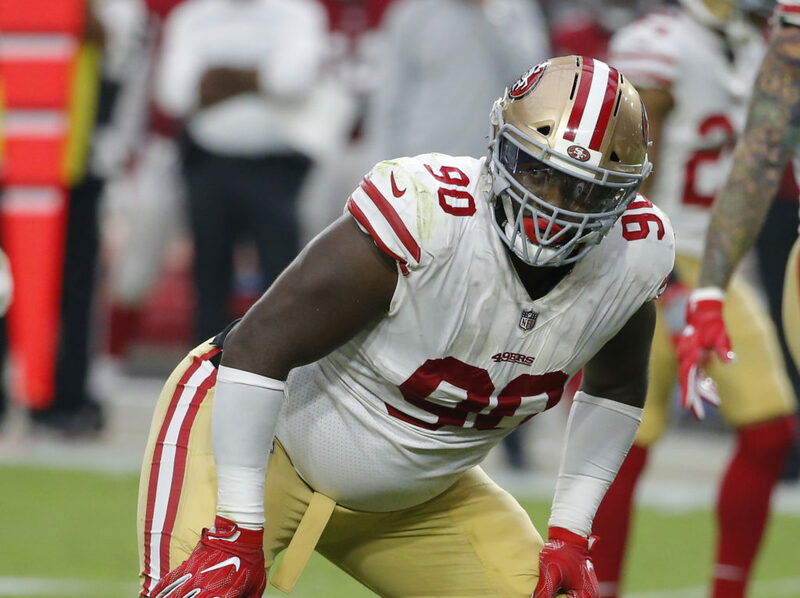 Jones may currently be 80% the player Mitchell is, and Mitchell may also offer superior veteran locker-room leadership, but that 53-player limit may not allow the Niners to carry two pure NTs. So I don’t see anything exaggeration or cliched on the part of Lynch. Just curious, how would you voice Mitchell’s departure? Nzeocha is just too raw, and does not have good football instincts. He does have skills, but he is learning on the field, and too many times, the other team took advantage of his inexperience. With the emergence of Warner and Elijah Lee, Coyle is expendable. Saw Jalen Jelks on the Senior Bowl Practice videos, and he looked explosive. Glad to see your acknowledgement on Jelks…He and Hollins are both potential All-Pro ‘Sleepers’…I would have added both Ward and Celek to the dust-bin, but I believe that they should both bring us additional draft picks…4th or 5th rounders…. Ward is a free agent, and Celek’s drops make him worth little. Glad they helped the Niners, and wish them well, but the Niners need to move on from their aging veterans who do not contribute. That’s really gonna attract free agents and current 49ers..to be here..
That’s too bad. Earl Mitchell seemed like a such a good dude. He played his high school football at a local powerhouse called North Shore High School. They’ve put a ton of players in the NFL. My sons played them multiple times and I was always impressed by their athleticism but even more impressed by their sportsmanship. The coach there runs an absolutely fantastic program. A close family friend of ours coached at North Shore in the late 90s and early 2000’s. He’s the same guy that coached Andrew Luck at Stratford High School. Anyway, North Shore had Andre Gurode and Cory Redding on the team during that era. My friend has a funny story about the playoff run in -I think- it was Redding’s senior year. They were playing Converse Judson in the 3rd or 4th round of the playoffs. North Shore was absolutely massive so the o-line coach had the o & d lines walk out onto the field without their shoulder pads on and walk directly in front of the Judson team as they were warming up before the game. North Shore outweighed Judson by 25-50 pounds at every position across the lines. The game gets started and Judson punches North Shore in the mouth from the 1st whistle to the last whistle and kicks their butts. My friend said Judson was the best coached team they ever played against. Perfect technique and 110% effort on every single play. I believe Judson won state that year. North Shore won the 6A State Championship this past year and their best players are sophomores and juniors. Look for a RB coming up named Zach Evans. My son played a varsity game against him when my son was a senior and Evans was a freshman RB starting on Varsity. Evans was the best player on the field as a freshman. Not sure where he’s going but I’ve heard he has offers from all the big schools. Their QB and the best receiver are both sophomores and will both also be at a school like Bama, Georgia, or Clemson. It’s like an all state football team all concentrated in one area. “The final game took place in 1976 during a torrential downpour at Soldier Field on July 23. Despite featuring stars such as Chuck Muncie, Mike Pruitt, Lee Roy Selmon, and Jackie Slater, the all-stars were hopelessly outmatched by the Pittsburgh Steelers, winners of Super Bowl X. The star quarterback for the College All-Stars was Steeler draft pick Mike Kruczek out of Boston College. I wonder where Saleh plans to play Kentavius Street. He brings great strength to the dline and may prove explosive to. I think his recovery made Mitchell expendable, along with the emergence of DJ Jones. That is life in the NFL, along with the coach speak. Although it goes against my grain, I wonder if Street could become (retrained) to an Olineman….anyone who can ‘dead-lift’ 700 lbs, could certainly beat out a couple of our OGs who can’t even seem to get in a Dlineman’s grill…. Antonio Brown in a “photoshopped” 49ers uniform hugging Jerry Rice. I didn’t realize that pictures could be so well modified using photoshop or similar software. I can’t see anything that indicates it isn’t a genuine picture. There are artifacts that make it a dead giveaway as a Photoshopped picture but it is a very good job. Helps that we don’t see the face though. So it’s probably not Brown in the picture. So it might have been another 49er and all that had to be altered was the name and number. That would be relatively easy. Right. It almost looks like a composite of several photos. I think there is one of Rice, his hand and of the 49er player whose number was altered. Ted Nguyen is down in Mobile and he mentions TE Josh Oliver of San Jose State which is ten miles southeast Levis. At 6’4″ and 246 lb he showed “explosiveness and speed were head and shoulders above every tight end at the Senior Bowl.” A good late round pick, maybe. On the other hand, Rock Ya-Sin did not quite rock the tape measure, measuring 5’11” instead of the listed 6’2″ — yuge difference…. Josh Oliver may be a good late FIRST round pick since he is ranked 28th. Rock Ya-Sin is listed at 123, so he will use the Senior Bowl to move up from a late 4th round ranking. Montez Sweat is listed at 54, so that is a late second round ranking. Still, by being labeled the best pass rusher in the Senior Bowl practices, he made a lot of money these past few days. Montez Sweat was the talk of the Senior Bowl practice in the first couple of days until he went up against little known former Elon University OT player Oli Udoh. Udoh opened some eyes this past week. Udoh showed great athleticism for a guy who is 6’5″ 356 lbs. He may be a 4-5 rd steal. The problem the scouts have with Sweat is that he has basically one move. He bullrushes people extends his arms and drives them back into the qb. This type of attack typically doesn’t translate against NFL level tackles. It also explains why he was a no show going against better tackles in college. They were hoping to see him demonstrate the ability to run the ark or bend but he hasn’t showcased that yet. I saw that… but it doesn’t give necessarily give me confidence. Agreed. On a different note, Metcalf has been cleared for football and will take part in the Scouting Combine and other pre-draft workouts. Can’t wait to see how fast he runs…. Yup. I was also a little disappointed in Jaylon Furgeson’ low grades. His lack of explosion is a big red flag. Makes me wonder if these guys play at a higher level during the game given their high college stats. The fact the 49ers had him mostly playing big end this week I think is a pretty clear sign of how the 49ers view Ferguson. They don’t see him as a dominant pass rush end. The 49ers are stacked at big end so I think Ferguson has little chance of being a 49er. Sweat reminds me a bit of Aldon Smith. Not necessarily as good, but that kind of pass rusher. I think 49er fans have a bit of an overrated opinion of what Aldon was. He was never a guy that really won with a speed rush or through great bend and dip around the edge. His best asset were his huge levers that he could use to keep OL off him, strike first to get them off balance, and push them around. He also head a great ability to get skinny on stunts. That’s kind of what Sweat is. Huge wingspan that gives him the ability to stay clean and get OL off balance and going backwards. He will need to really dominate hand fighting to be a good edge rusher in the NFL. Personally I prefer other edge prospects, and I suspect the 49ers will too. The Leo role is usually more for a really high twitch athlete. I wouldn’t read too much into what Saleh said, it is lying season. They want other teams to think they like certain players and not the ones they really like. I would be fine with Sweat but only in a trade down scenario. Not sure if Bosa falls to us at #2, but if he doesn’t I’m starting to lean towards Q.Williams. While the consensus seems to be on Allen at #2, I feel that Williams can wreak more havoc. Williams will likely demand double teaming that will free up other defenders to penetrate the backfield. The scary part is they might use this as a reason to justify Quinnen Williams. If they do I will call for an end to this regime immediately. He’s not the next Aaron Donald, h might be fletcher cox or Gerald McCoy but even then he won’t boost the team as much as a competent edge rusher would.